The traditional way of ending calls on an Android smartphone is to bring the phone away from your ear, take one last look at your contact's avatar of choice, and tap down on the end call button. If you want something that's a little more convenient—and slick—then you can use the power button instead, with no extra add-ons or hacking involved. 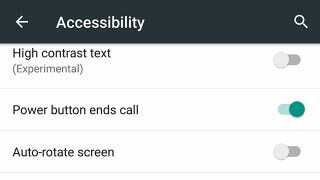 The option you want to tweak is in the Accessibility menu in the Settings app. A collection of tools designed to help those who struggle using a smartphone in its default configuration (but which can be handy for the rest of us too). Once you're into the Accessibility menu, tap on the Power button ends call toggle switch and you're good to go. Whether you don't have two hands free to operate your huge Nexus 6 or you don't want to take your eyes away from something else (like the ball game), it's a convenient alternative that you might not know about. Chances are your fingers are already close to the power button anyway, so it's a more satisfying way of hanging up abruptly too.